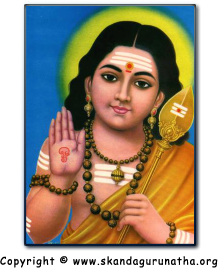 Another famous work of Saint Arungirinathar is Kanthar Anthaathi. This is a work of 100 verses. Each verse is of four lines and mostly all the lines of every verse begin with the same words with, of course, different meanings. Antha means "end" and aathi means "beginning," and Anthaathi is a particular type of work wherein the last word or phrase of the previous verse forms the beginning of the next verse  the "antha" (end) of a verse is the "aathi" (beginning) of the following verse. It is believed that this work was the outcome of the literary contest between the learned but arrogant Villiputturar and the devout, divine-inspired Arunagirinathar. The condition was, it is said, that Arunagirinathar should compose Anthaathi songs without interruption and Villiputturar should at once give their meaning, he who failed to do so would have to accept defeat. As it was composed mainly for the purpose of a literary competition, the language and style are so hard as to baffle even learned scholars, and one can imagine their toughness from the fact that Villiputturar who had won over all the Tamil poets and Pandits of his time failed even to decipher the 54th song whose four lines comprising 97 letters are composed of letters of only the Tha-Varga, i.e., Tha, Thaa, Thi, Thii, Thu, Thuu, etc. Only Arunagirinathar could give its meaning and even to this date no one attempts to comment on it, except to reproduce Arunagirinathar's word-to-word meaning. A very special thank you to Dr. C.R.Krishnamurti who dedicated a lot of his time and health in translating into English the above meanings of Kanthar Anthaathi. Thank you Sir for the dedication and for undertaking this wonderful divine service. May Bhagavan Sri Skanda's Divine Love, Light, and Blessings be with you always!